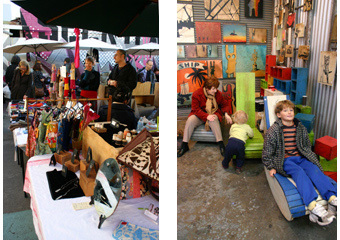 The Rose Street artists market in Fitzroy is an insiders tip and hidden Melbourne treasure. It is one of those cool places to hang out on weekends. Being small, alive and engaging, it hasnt got the stereotypical sameness you can find in some other markets. It is located in a former junkyard in the back streets of Fitzroy and has become a unique outlet for emerging artists and designers. Here they can showcase and test their work in front of an interested and appreciative audience. The Rose Street market displays original art and craft of up to 70 artists and designers - regulars, as well as newcomers. You can admire and buy high quality work - art, quirky treasures, works on paper, metal and jewellery creations, leather bags and purses, prints, handmade paper and books, clothes, paintings, rocking chairs - all original handcrafted and made locally. It is a lively community. You can chat to the artists and crafts people and find out the stories about their work and developments. One of our favourites is Carey Potter, a designer and maker of furniture you can really live with and really sit on. and live entertainment throughout the day. And, in true Melbourne style - for the love of life and beautiful things - it has an outdoor café with a great espresso machine and homemade food. You can get a good cup of coffee, find someone interesting to talk to or just hang out. 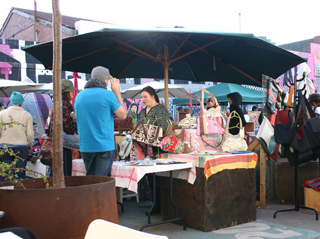 This market is modelled on similar markets in New York, Berlin, as a venue for artists and crafts people to sell their stuff directly, without the commercial middlemen. 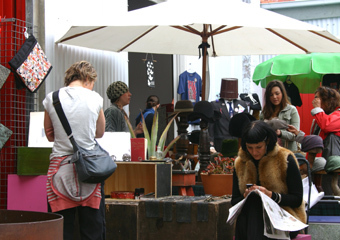 The Rose Street market is open Saturdays and Sundays from around 11am (when eclectic Fitzroy wakes up). It is a short walk from Brunswick Street (tram #112) and Nicholson St (tram #96), Fitzroy. Take the stop after Johnston St when travelling away from the city.